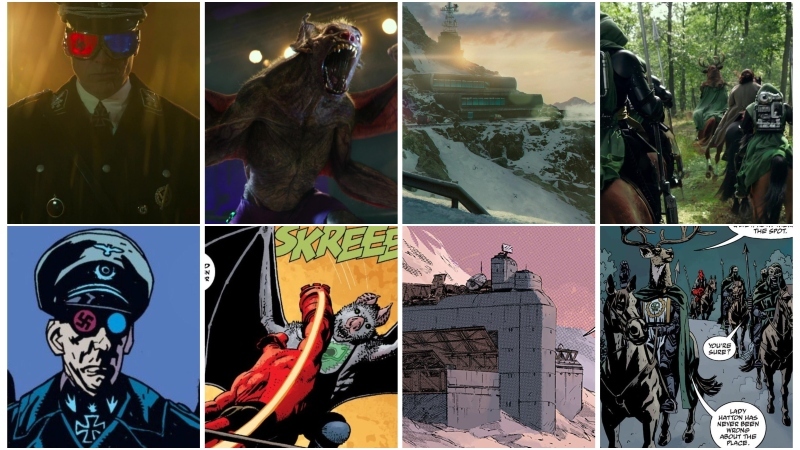 Author’s note: We’re going deep into the Hellboy comic books here, so potential spoilers for the comic books only. The new Hellboy movie starts with the title hero in a specific place, Mexico. Though this happens in the 1950s in the comic books for Hellboy, the movie is pulling from that timeline to give Big Red a specific starting point. Hellboy is taking time away from the BPRD, drinking away his problems, and even doing some wrestling on the sides. A post on the wall I noticed on set advertises “The Crusader v Camazotz,” a match-up right out of the Hellboy in Mexico story line. You’ve even seen it in the trailers already. 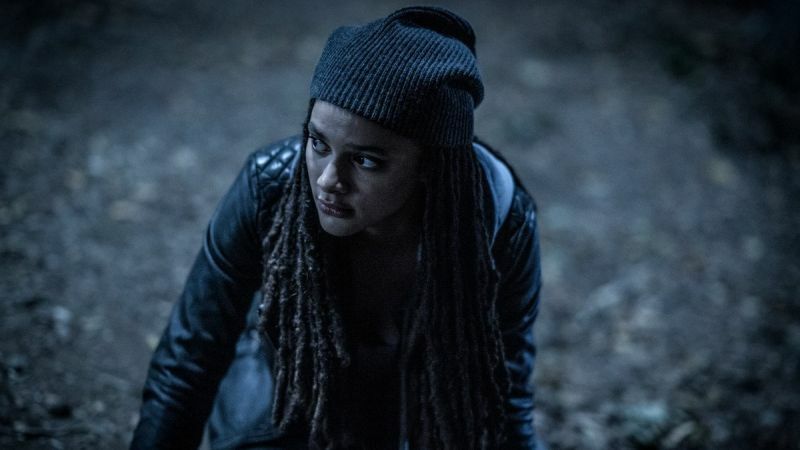 In the comics, Alice (played by American Honey’s Sasha Lane) and Hellboy have a funny beginning that was later tied into the larger story. The pair “met” when Alice was a baby and was kidnapped by fairies. Hellboy intervened and returned her safely, creating a lasting impression on the young woman and making an enemy for life in Gruagach. These humble beginnigns will remain the same for the movie. In the context of The Wild Hunt, the story kicks off as Hellboy is summoned to The Osiris Club, a paranormal group in England that has a long history with the character and a specific problem that they need his help with, a group of Giants going out for a stroll. As far as the group themselves, they exist under the same circumstances in the film as they do the books, a group of crusty old Englishmen that formed a secret society as a branch off of another secret society (The Heliopic Brotherhood of Ra, who even get name checked in the film), and who have an interest in self-preservation and the occult. The Wild Hunt, their every-few-years gathering to hunt Giants, with its trademark deer-head wearing leader, is all there too, not to mention the stuffed and mounted Giant heads on the wall. The evil witch Nimue, played by Milla Jovovich in the film, has the same origins and ambitions in the film as she does in the comics, namely, world destruction and a summoning of monsters. Her appearance is slightly altered, but the character’s look in the movie isn’t very far off from her looks in the source material. 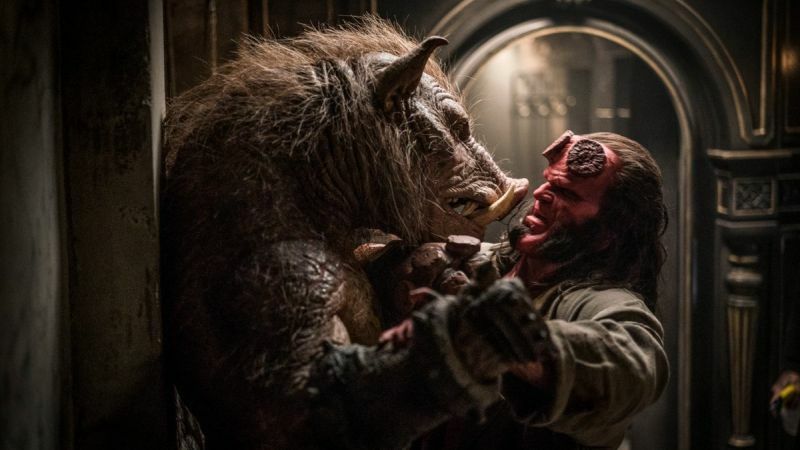 Furthermore, her right hand man…er pig, Gruagach, is not only present in the movie but has the same origins in the film as he does in the comic, a history with Hellboy that goes back decades. Gru will be brought to life by actor Douglas Tait with a practical suit and a fully animatronic head, no CG required (though some will be used just to make his mouth movements a little more fluid). The witch of Russian folklore and her house on a chicken leg have made a faithful leap from the page to the screen (though her house has a few more rooms in the movie than it does in the pages of Mignola’s stories). 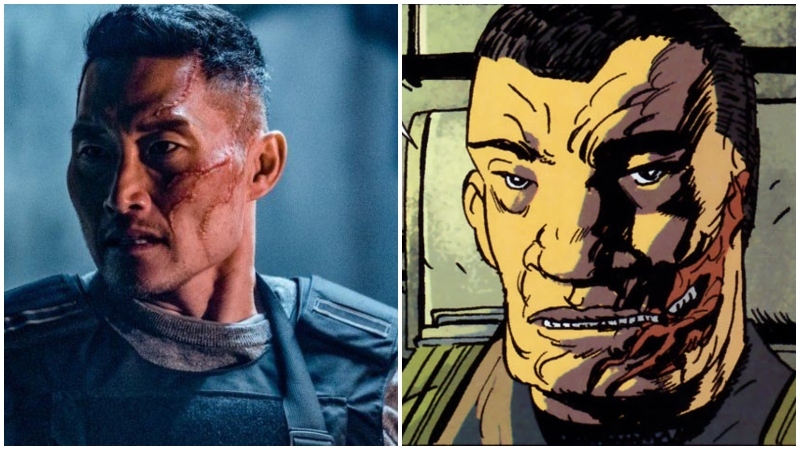 Major Ben Daimio is a big presence in the BPRD comic books, having trasnferred to the service after working in the Marines for decades. His decision to join the group stems from an encounter he had in Bolivia leaving him scarred on his face and…cursed, for lack of a better word. In the context of the Hellboy in Mexico story, Hellboy is sent to the country to handle a problem but ends up resulting in him sticking around and drinking himself into a hole (and fighting a lot of vampires). 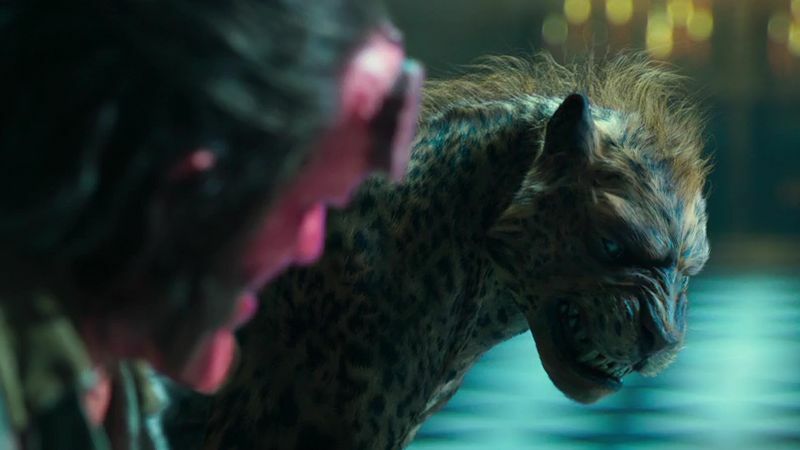 At the start of the film, Hellboy will be in Mexico but more as him being on sabatacle from the BPRD. He’ll still fight some vampires though. In the film, the BPRD’s main headquarters will be tucked away in the mountains of Colorado. Though this is a location used by the bereau in the source material, by the time they relocate there it’s well after Hellboy has left. In addition, the character will be a Japanese-British character for the film instead of a Japanese-American. The change from American to Brit was written into the script as well, which is why Ed Skrein was on the producer’s radar when he was originally cast. In the comics, Alice seemingly has no powers and her only affiliation with the BPRD is that she’s in a romantic relationship with Hellboy (who is no longer affiliated with the group when they get together). In the film, she’s a part of the BPRD and has abilities, working as the team’s field psychic. In the comics, Alice and Hellboy have a romantic fling, the pair are still close in the movies but are no longer an item. That particular fact has never been addressed in the source material. In the pages of Hellboy and BPRD comics, despite being major figures, Ben Daimio and Hellboy never actually met, and seemingly never will meet. Daimio however is a big part of the film, and will share a lot of screentime with big red. By the time The Wild Hunt storyline comes about in the comics, Professor Bruttenholm (pronoucned Broom) has been dead for about twenty years. The new film gives him an extended life and offers it a chance to dig into the relationship of Hellboy and Broom in more ways than the previous movies. The BPRD’s London HQ will be a big part of the movie, hidden underneath a fish and chip shop on the street. This is something created entirely for the movie. 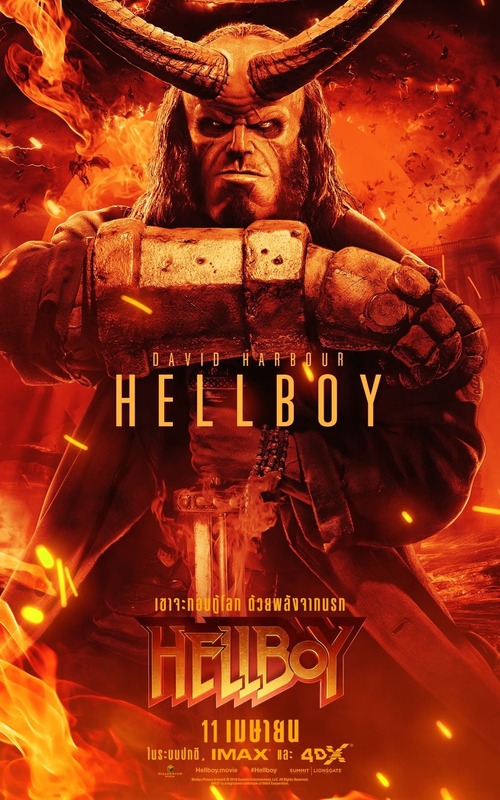 Hellboy debuts on April 12, you can buy tickets by clicking here!